In the summer of 2018, we undertook one of our largest and most exciting project to date. We were contacted in November 2017 by a client who had recently purchased a new build home in Thame, Oxfordshire. Their large garden was a blank canvas of turf and basic paving and they desperately wanted the space to reflect the interior of their stylish new property.Having sought a designer of their own, we were provided with the plans and drawings and asked for a quotation to build the proposed landscape. The design was created by the impressive and reputable Garden Designer Richard Key and we were excited to explore the drawings and learn more about the vision he had in mind for the space. The garden would take approximately 10 weeks to build with a budget of approximately £60,000. 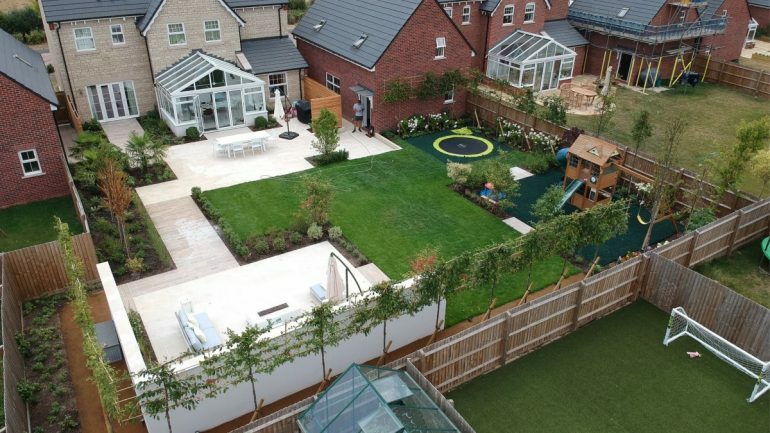 It would incorporate a complex planting supplied by Folia Europe designed to provide instant privacy, a trendy and relaxing seating area, lawn surrounded with metal edgings, a variety of different paving types and an imaginative play area for the younger residents at this home. We were also asked to design a full lighting and irrigation plan for the garden too. Once underway, the initial stages of the garden involved striping the existing lawn and paving back to a blank canvas. It can sometimes be hard to appreciate how a space looks after a transformation and so our drone proved extremely useful in taking some birds eye view shots of the work in progress. 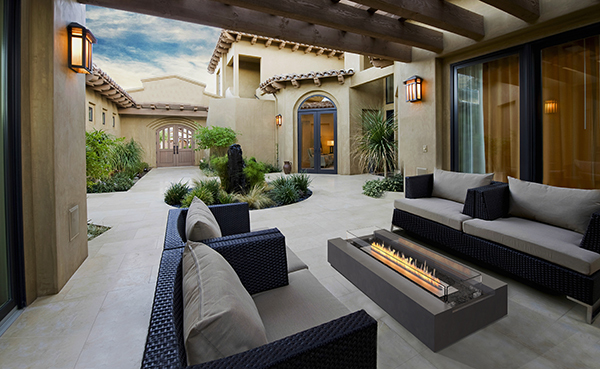 The team then began to lay the patio and construct a large rendered wall, which created the perfect back drop for the seating area. The garden featured lots of other quirky items such as a drainage grate by Lateral Design. It is always useful for the team to work with new, innovative products and materials. The main paving used within the garden was London Stone, Khaki and the paving featured in the pathway is Bradstone, Madera, both of these are Porcelain which is proving extremely popular due to its toughness and the ability to provide and ultra modern look matching a homes interior. Whilst the majority of the garden is on one level, there are also steps which run down to a lower path at the side of the house. The garden also comprised Cedar screening to add privacy and a sunken trampoline for the children. The play area also has recycled rubber chippings from Monster Mulch and a large climbing frame, which creates the perfect soft surface for outdoor play. The lighting which Jack designed compliments the screening wonderfully and creates the perfect night time ambiance, added to by the contemporary fire pit installed at the back of the garden. The elegant lighting around the seating area finished the garden beautifully and created an aesthetic exactly as the client desired. We all thoroughly enjoyed building this exceptional garden and look forward to working alongside Richard on many projects in the future.